He was an angry man. Had he won that fight he would have forced Mohammad Ali to fight him again and he could get his title back. George Foreman didn’t call it the Heavyweight Title, he called it his title. 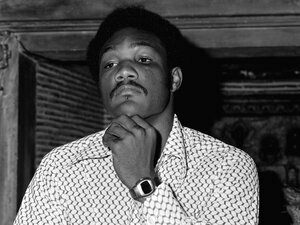 The year was 1977 and George Foreman had been on the comeback trail. He had won five consecutive fights and that night he fought a man named Jimmy Young. George had a devastating punch. Usually his fights would end with his opponent on the canvas. This fight would be different. Jimmy Young lasted the whole fight. When the decision was read it was Young who had his glove raised. George was crushed as he walked around in the steamy hot dressing room. He had heard that after a match you should never sit down. He paced back and forth and felt weakness in his legs. “I feel like I’m going to”, and before he could say die he passed out. George Foreman at a joyless time in his life. George Foreman was born in Marshall Texas in 1949 and grew up in Houston’s rough Fifth Ward District. Looking back he called himself a thug as he dropped out of school in the ninth grade, and ran the streets. In 1965 he joined the Jobs Corps and that decision changed the direction of his life. At the age of 16 the Jobs Corps provided him with a connection to the boxing world. It was in a trainer named Doc Broaddus. Doc encouraged George to apply his fighting skills to the ring instead of the streets. George developed quickly as a boxer. He had a mean streak that seemed to help him when he got his opponent in trouble. He was always able to summon the old one two at just the right time. He made the 1968 Olympic team and after winning the gold medal he made headlines waiving a little American flag. This was the Olympic games where two African American runners raised clinched fists wearing black gloves in tribute to black power. In contrast George’s waiving of the American flag made the statement that he was proud of the country he represented. After the Olympics George turned pro. There was much learning to do but he rose in the ranks with each success. George was 6 feet 3 1/2 inches and 218 pounds of raw muscle. He was feared by everyone he fought because of his ability to pound his opponents unmercifully to the canvas. He won his first 37 professional fights which earned him a shot at the heavyweight champion “Smokin” Joe Frazier. It was 1973 and George was a heavy underdog. The fight was held January 22, 1973, in Kingston Jamaica. Shockingly George knocked Joe Frazier down six times in the two round fight. Finally the referee stopped the bout and George’s glove was raised in victory. before facing Ali again. Jimmy Young was a fighter much like Ali. He was a very good defensive fighter who had quick hands. George plowed in determined to hit Jimmy Young with the hay maker that would stop the fight. Jimmy was able to block George’s attempts again and again and jab his head with a pestering left. Round after round the same thing happened. George charging in only to get sent away by Jimmy’s quick hands. In the 7th round something different happened. George plowed in as usual but this time he connected. Jimmy was hurt and staggered to the other side of the ring. George was right after him determined to put Jimmy on the canvas for good. Somehow in his hurt condition Jimmy was able to block and duck most of George’s attempts. George was always able to finish off an opponent when he had them hurt. He could always count on the old one two, but this time victory would not come. Adding to his frustration the fans started chanting loudly “Jimmy Young, Jimmy Young.” George wondered why the fans wouldn’t chant for him? Jimmy recovered and for the rest of the fight was able to pile up points as George punched a lot of air. When George was on that dressing room floor he had an encounter like never before. He felt like he was in this empty place and that the Lord spoke to him. The Lord said, “I don’t want your money, I want you.” When he came to he was shouting “Jesus Christ is alive in me”. George retired at the age of 27 and went into ministry full time. He formed an independent church and lived each day for the Lord. All of the bitterness that he had kept inside started to go away. His heart was full of love as he forgave Ali and everyone else that had been on his hate list. In 1987 George had a desire in his heart. He had ballooned up to 315 pounds but the unmistakable desire was there. He decided to get back into boxing. He was old now in boxing terms at 38. Yet it was almost like God had given him the desire to complete the work he had started. George started winning boxing matches again. He was big and slow but he still packed a wallop. George trained hard and got his weight down to 250. Although he wasn’t the fighter he was he became very popular wherever he fought. In a drastic switch George was the fan favorite. Because of his popularity fans wanted to see George fight for the heavyweight title. Evander Holyfield had the title and gave George a fight. George fought gallantly but it wasn’t to be. Evander kept his title that night. Very interesting story on Foreman, Lewis. I am not a boxing fan so I never knew about any of this. It is a great testimony to the goodness of God and how He transforms lives that are submitted to Him. Thanks Lewis! Blessings to you daily!